☀Do not give too much press during sharpening process, neither pull your knife back and forth in the grinder slots, or you will damage the blade. ☀Do not put the sharpener in a dishwasher or rinse in water. ☀After sharpening your knife, wipe the sharpener with a damp cloth or rinse with water, then wipe dry with a soft cloth to clean the metal part and ceramic rod. ☀Keep the sharpener or knives out of reach of children to avoid accidents.Click add to cart and order now. ☀This chef's priority manual kitchen knife sharpener can compatible with various kinds of knifes, pocket knife, stainless steel knife, serrated knife, scissors, utility knife, army knife, tactical knife, buck knife, hunting knife, butcher knife and so on. ☀【SMALL & EASY TO USE】This knife sharpener is easy to use. Simply position the dull blade on the sharpening slot and enjoy razor-sharpness in just seconds. It is very suitable for manual operation. ☀【Non-Slip & SAFE】This kitchen knife sharpener comes with non slip mats to make sharpening process much safer. Non electric, so you don't need to worry about the leakage of electricity. ☀【WIDE RANGE OF APPLICATION】This 3 stage diamond coated knife sharpener compatible with various kinds of knifes, pocket knife, stainless steel knife, serrated knife, scissors and so on. ☀【SOLID & EASY TO CLEAN】The body of this priority chef knife sharpener is made of solid ABS material. And you can take the sharpener head out by pressing and pulling the small groove, then clean it with flush water. 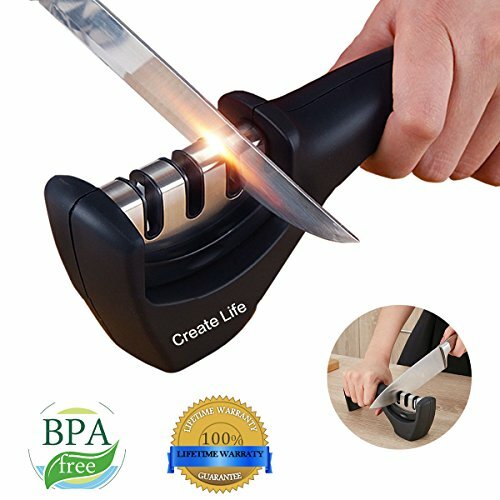 ☀【LIFETIME WARRANTY & 100% SATISFACTION GUARANTEE】We guarantee you'll love this manual kitchen knife sharpener. But if you're not satisfied with it, please get in touch with us. We will gladly give you a 100% refund. No questions asked! If you have any questions about this product by Create Life, contact us by completing and submitting the form below. If you are looking for a specif part number, please include it with your message.